Your doors are not only entryways for burglars but escape routes for heat as well. According to statistics, 70% of burglars in the UK get into homes via a door and 25% of the heat in your home escapes through doors whether they’re unopened or locked. With the right tools, burglars can break into your home but with uPVC and double glazing, you can make your doors not only beautiful entryways into your house but tough security against heat loss and opportunist intruders as well. Compared to standard doors, doors that are double glazed can protect your house from draughts and keep the heat in. When fitted with uPVC frames, they become resistant to weather damages and forced entry while requiring almost no maintenance at all. Composite Doors are regarded in the industry as the best quality, most secure and reliable External Residential Doors available for your home today. Unlike uPVC Doors (only 28mm) the 44mm core construction gives the Door its superior strength and reliability. uPVC Doors have an outer and an inner frame for glazing, giving a bulky appearance. 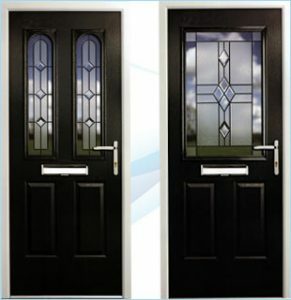 A Composite Door is hung directly on the reinforced outer frame giving a more traditional appearance. With a fully reinforced outer frame, high security Secure-By-Design Locking System and super tough GRP outer skin. The Composite Door is the Most Secure Exterior Replacement Door available on the market today.